Dubai, United Arab Emirates, March 31, 2019: Dubai Turf, the $6 million horse race sponsored by DP World, had a grand ending today at the Meydan Racecourse with Almond Eye ridden by Christophe Lemaire and owned by Silk Racing Co. Ltd. emerging as the winner. The race is one of the richest in the world and formed an exciting climax to the Dubai World Cup, one of the most anticipated events in the horse racing calendar. Dubai Turf is one of the world’s premier Group 1 grass races and is run on an 1800-meter (1 1/8 mile) track around the turn of the turf course. 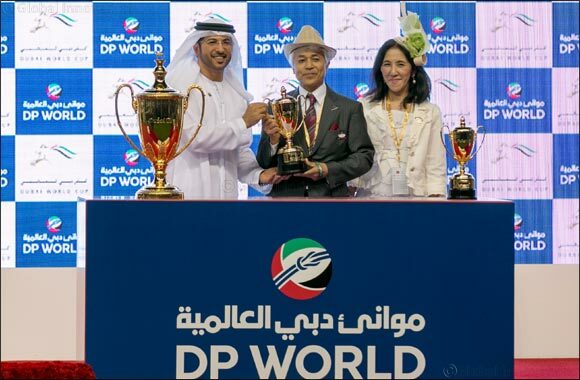 Abdulla Bin Damithan, Chief Commercial Officer, DP World, UAE Region, presented the trophy to the winning stable. He also congratulated Silk Racing Co. Ltd., the owner of Almond Eye, his trainer Sakae Kunieda and jockey Christophe Lemaire for their outstanding performance. The Dubai World Cup has emerged as a popular event on the global racing calendar and is hosted at one of the world’s leading sporting hubs. While millions of people around the world watched it live on television, thousands of racing enthusiasts gathered at the Meydan tracks in Nad Al Sheba to witness the spectacular event.